Photos by Michelle Davies | The Journal Gazette The Rev. 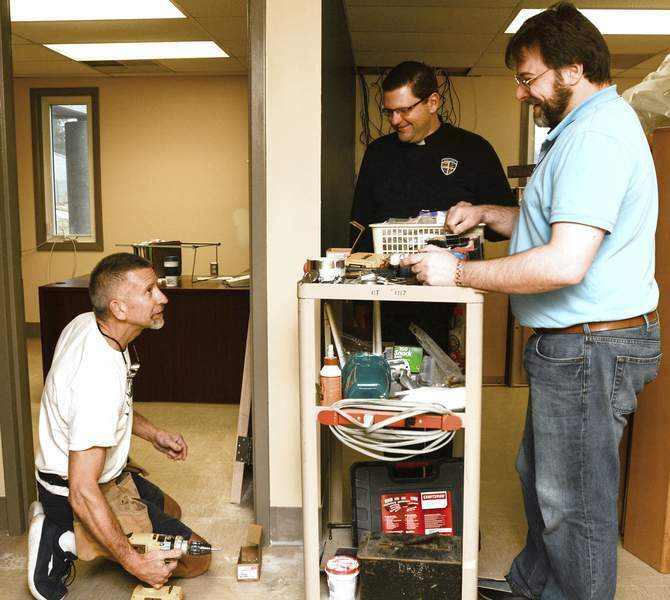 Mark Gurtner, center, pastor of Our Lady of Good Hope Catholic Church, discusses renovations for the parish’s new K-8 school with Principal Eric Grekowicz, right, and Steve Kohrman, parish property manager. 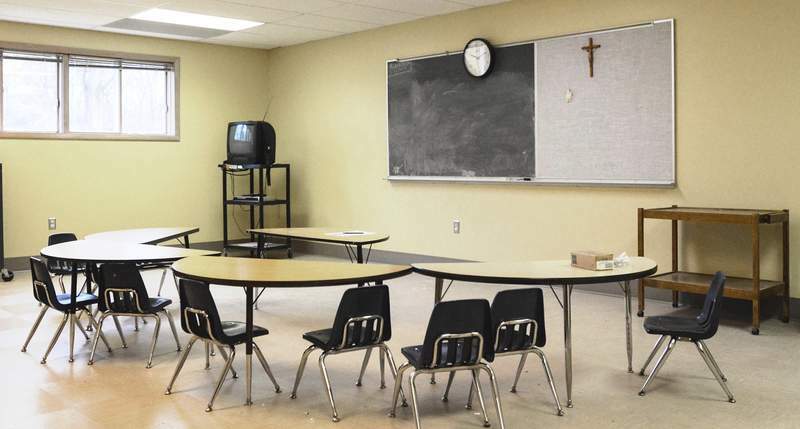 A first-grade classroom at Our Lady of Good Hope on St. Joe Road will be full when the school opens this fall. A Roman Catholic parish on Fort Wayne’s far northeast side is bucking trends by starting a new parochial school. And not only that, school officials said: They also hope to start "a sea change" in local Catholic education, said Eric Grekowicz, newly hired principal of Our Lady of Good Hope School. Grekowicz said when the school opens for the 2016-17 academic year, it will be the first in Fort Wayne to use the classical model of education – something he said is growing in demand nationally. The model, he said, seeks to integrate traditional subject matter areas such as science, mathematics and social studies into all lessons, instead of building walls between disciplines. Another precept, he said, is treating students holistically. "What it does is it takes methods of education that have evolved from thousands of years of human history and ... fosters the development of well-rounded, independent thinkers grounded in faith," Grekowicz said. Heather Gossart, a consultant to the National Catholic Educational Association, said there’s no groundswell of parish schools switching to the classical model. But, she said, it has found a niche as schools strive to combat declining enrollment and distinguish themselves in an increasingly competitive environment that includes charter schools and home schooling. According to association statistics, national Catholic school enrollment has generally been in decline since peaking in the 1960s. Since 2005, 1,648 schools, or more than 20 percent, were closed or consolidated, while only 336 schools were opened. Of the closed schools, 430 were elementary schools. How many schools are now using the classical model is difficult to determine, she said, because of its relative newness. "There are dioceses and school communities that really celebrate the return to this approach of traditional Catholic education," she said. "They look back and believe it produced well-rounded, articulate young people who really had a very broad learning base." The Rev. Mark Gurtner, Our Lady’s pastor, said parents pushed for the school in the approximately 1,100-family parish. The church and school are located at 7215 St. Joe Road, north of Shoaff Park. Plans began about two years ago, he said, after a parent of several school-age children asked him to consider starting a school. Although the parish ran a preschool, parents were sending their elementary-age children to several other area parish schools, including some far from their homes. "You want (your family) to be completely immersed in your faith and your parish life, and that’s difficult when your school is somewhere else, and I didn’t really realize how difficult that was," said Natalie Kohrman, 40, of Fort Wayne. She plans to send five of her and her husband’s seven children to the new school. The children now attend the parish school at St. Louis, Besancon, near New Haven, about 15 to 20 minutes away from home. Kelly Ley, 37, said she was attracted by the classical model. The Fort Wayne mother of seven became acquainted with it while home schooling. "One thing about it is it teaches them (children) how to think for themselves. ... My children really loved it, and it worked well with them." Gurtner said the school will include one class of 18 to 21 students from kindergarten through eighth grade. About 160 students can be accommodated, he said, and 132 are now rostered. Second grade has filled up, he said. Children of members were allowed to enroll first, Gurtner said, but enrollment is now open to anyone, Catholics and non-Catholics alike. The school will accept vouchers and strives to provide financial aid, he said. State-funded vouchers are a significant source of revenue in meeting operating expenses, Gurtner said. The church building is now undergoing renovations to accommodate the school. There will be nine classrooms, two computer labs, a library, a dedicated science lab and a gymnasium, which will double as a lunchroom. However, students will be required to bring packed lunches, Gurtner said. The church’s rear entrance is being reconfigured to include security doors and a buzz-in system. "It’s been quite an undertaking," Gurtner said of starting the school. About $450,000 in startup costs have been covered by donations, the Mary Cross Tippmann Foundation and other foundations, he said. Some parents of preschoolers were disappointed that the preschool closed, but enrollment there had declined, Gurtner said. Parents were directed to other preschools. Grekowicz, 45, who has a doctorate in English and has been involved with the classical model for years, is recruiting teachers and hopes to have the school staffed by July 1.